Dine Around at Bluefin Bay! BLUEFIN GRILLE: Experience the Bluefin Grille’s sophisticated yet casual atmosphere while savoring the most breathtaking views on the Shore at this two-level restaurant located on the main Bluefin Bay property. 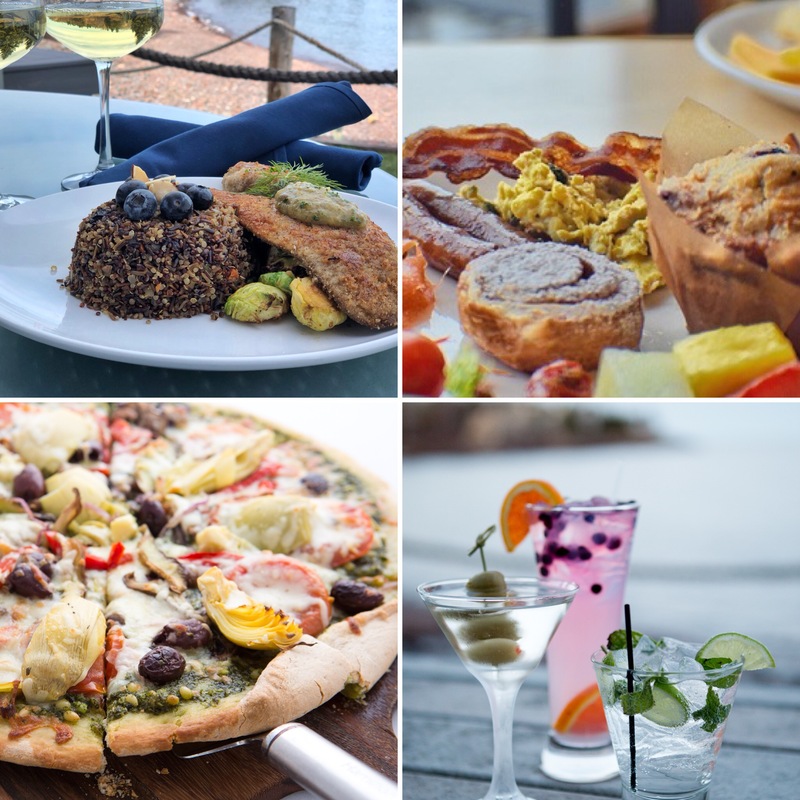 The Bluefin Grille is open daily 8 am-9 pm with a Happy Hour from 3-5 pm, a Late Night Menu from 9-11 pm, Bar hours until at least 11 pm, and on a warm summer day, you’ll love the waters edge patio for dining until 5 pm. We are now offering a Breakfast Buffet daily from 8-11am! Learn more about a discount for pre-purchasing breakfast vouchers or book a Bed and Breakfast Package to enjoy the convenience and savings of combining bed & breakfast. COHO CAFÉ & BAKERY: Kick back and relax with an espresso or your favorite glass of wine in our casual, yet chic North Shore Bistro. Sample the award-winning pizza, fresh homemade bread, specialty soups and salads, or pastries and desserts. Open seven-days-a-week from 7am-9pm for breakfast, lunch, and dinner, Coho Cafe fare is available to eat in or take out. Coho Café is also your Grab-n-Go location. Pre-made sandwiches on homemade bread, gourmet salamis and cheeses, crackers, energy bars, bottled drinks, and more are available. Perfect for a picnic on the beach, tossing in a backpack for a mid-hike fuel, or happy hour in your room. We are now also offering Mimosas and Sake Bloody Marys seven days a week! WAVES OF SUPERIOR CAFE: Located at Surfside on Lake Superior, Waves of Superior Café offers breathtaking views of Lake Superior in a sunny, serene setting that complements our signature Waves of Superior Spa. We are open for the season daily from 8am-3pm serving breakfast, and brunch, Waves of Superior Café is a nice stop after your spa treatment, workout or hike. Grab something and go or sit in and enjoy the view from our deck. Contact us about hosting a catered event in our open-cafe space. At the Bluefin Bay Family of Resorts, we invite you to explore the shore powered by pedals! Bike rentals for adults and kids are included as part of your stay. 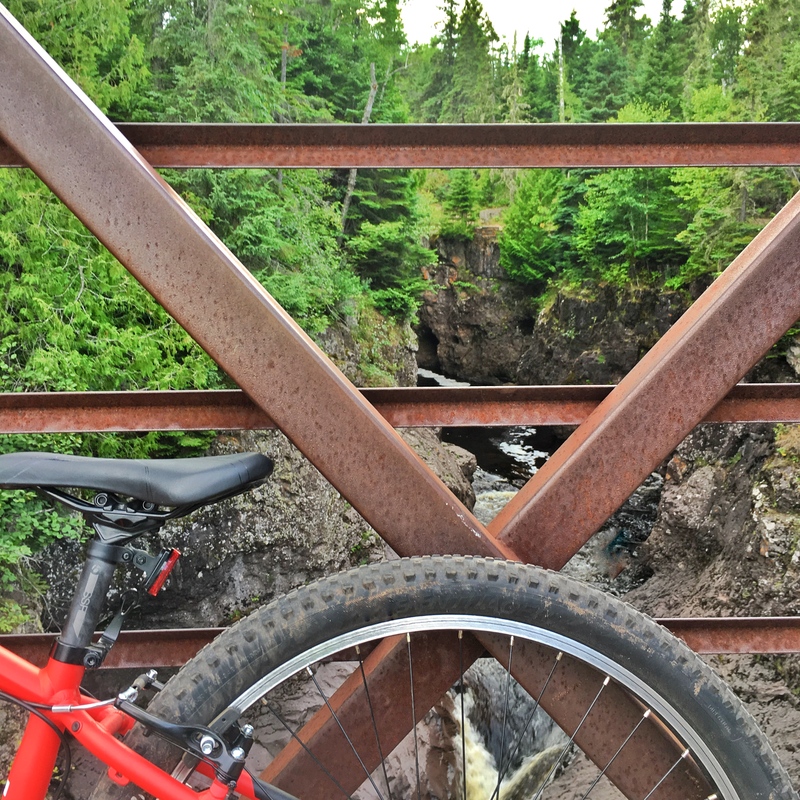 You can even join in on a complimentary guided trip – you’ll love our Temperance River Bike and Hike for a ride on a 2.1-mile section of the Gitchi Gami State Trail. Pedal through the northern forest containing birch, balsam, and spruce trees. Once we arrive at the Temperance River, you’ll be guided along the river on a short hike to catch breathtaking views of the many waterfalls the river has to offer. After hiking alongside the river take a relaxing bike ride back to Bluefin Bay which is a gentle down sloping path for an easy and rewarding way to finish the trip! 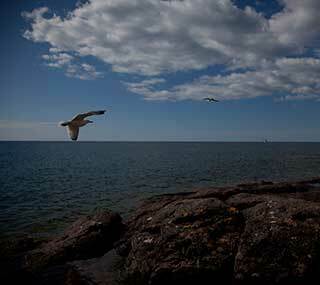 The Lutsen-Tofte and Grand Marais areas have become known as a haven for bikers and biking events. The Le Grand Du Nord Gravel Cycling Classic is coming up this weekend, May 26th. Starting out at the Grand Marais harbor this gravel course climbs almost 6000 ft! Live music, Voyageur Brewing Company beer and the vibe of Grand Marais make this a fun event for bikers and spectators. On June 23, the Lutsen 99er returns. Several thousand bikers from around the country gather to race through the pristine north woods of Cook County. The race is most known for its 99-miles of mountainous course, but it has now expanded to include a new 69-mile course, along with its 39, 19-mile courses and Sunday kids races. In addition to the wonderful local paved trail that runs right to the Bluefin Bay properties, this area has incredible mountain biking opportunities with even more in the planning stages. For single-track enthusiasts check out the Sugarbush Trail Association Trails located just a couple miles from the resort and the Pincushion Mountain Biking Trails in Grand Marais. Memorial Day Weekend: Family Fun on the North Shore! • The Big Lake, the inland lakes, the trails, and the forests! 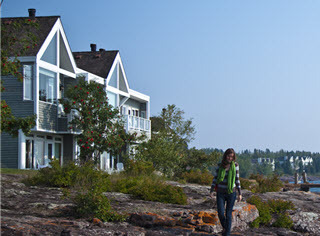 We have it all up here and you could end a day having canoed on an inland lake or river, hiked a trail in the Superior National Forest, biked on the paved Gitchi-Gami trail, and skipped stones into Lake Superior. There really are enough activities to please the whole family. • Guided Resort Activities! 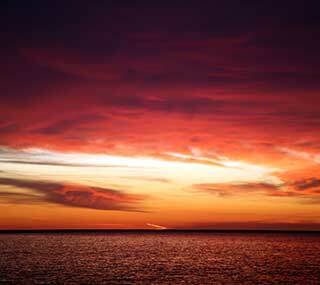 Our experienced and knowledgeable activity staff are here to guide you on complimentary resort activities. Experience fun area adventures in a safe and instructional environment where all abilities are welcome. 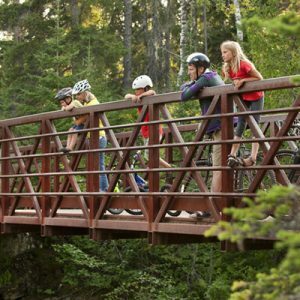 On Memorial Day Weekend you can sign up for activities like the Kids Adventure Club, hikes to Cascade River or our new Dyer’s Creek hike, bike and hikes to Temperance River State Park, yoga, plus winery shuttles to check out the fabulous North Shore Winery. Visit our Seasonal Recreation page for other fun experiences to take advantage of during your vacation. • The North Shore is full of fun local activities on Memorial Day Weekend. One of our favorites is Art Along the Lake: Spring Gallery Tour – head out on a tour of special exhibits, demonstrations and activities at art galleries all around Cook County. For the bikers in the family, the Le Grand Du Nord is a gravel cycling race of 20, 66, or 120 miles to challenge riders of all levels. Check out the Visit Cook County Events calendar for a list of all area activities and entertainment. 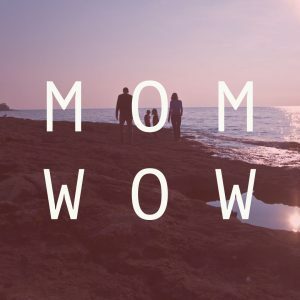 Mother’s Day is coming up this weekend and there are so many ways to celebrate Mom here on the North Shore and at Bluefin Bay Family of Resorts. Lakeside dining, relaxation at a spa, or an outdoor adventure – whatever your Mom loves to do you’ll find it here! Dine! Treat Mom to lunch or dinner at the Bluefin Grille. In addition to our full menu, we’ll be offering a special from Noon – 9 pm on Sunday, May 13th: Cornish Game Hen with a side of Cranberry Barbecue Sauce, Wild Rice Stuffing, and Roasted Brussel Sprouts with Bacon. We will also have a delectable Bluefin Blueberry Cheesecake for dessert. As another dining option stop by Coho Café & Bakery for coffee, breakfast, lunch, or dinner. Treat Mom to a signature Sake Bloody Mary or receive a FREE Mimosa with a breakfast, lunch, or dinner meal purchase on Sunday, May 13th! Spa! Mom deserves a day of pampering and what better way than with a spa treatment from Waves of Superior Spa. In addition to many great massage options, we now have a nail technician and appointments start on May 13th. Treat Mom to a mani or pedi just in time for sandal season! Adventure! 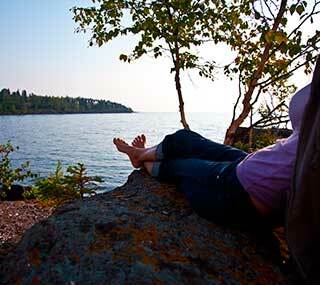 If Mom loves to unwind in the great outdoors you’ll have endless activities choose from during a North Shore getaway. Hiking, biking, golfing, trail running, waterfall viewing, and wave watching are activities to enjoy with the whole family. Check out our seasonal recreation page or join in with the many resort activities & events available during your stay. There are also many fantastic events and activities happening in the local area and you can explore all the options on the Visit Cook Count Event Calendar. Top off a day outdoors with some great local shopping or a visit to a local brewery or winery for an extra special Mother’s Day treat. Another fun idea for a great Mother’s Day gift is a Gift Card. From lakeside lodging and meals at restaurants to rejuvenating spa treatments at Waves of Superior Spa and souvenirs from the resort gift shops, our gift cards can be used anywhere in the Bluefin Bay Family of Resorts — at Bluefin Bay, Surfside and Temperance Landing on Lake Superior.